Have you been to the top of a 100 story building and looked straight down at the street? Now, imagine two 100 story black buildings on both sides of a street, the length of Manhattan. 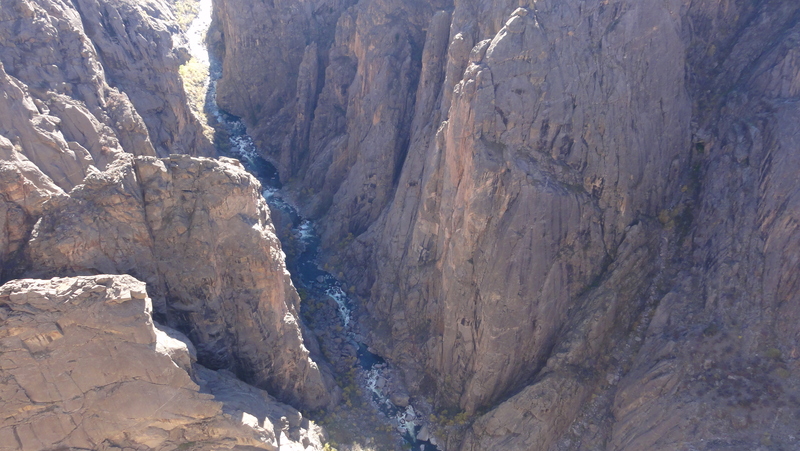 That is Black Canyon of the Gunnison. Black Canyon flanks the Gunnison River. Unlike most of the red rock canyons in the western US, Black Canyon is, well, generally black. The canyon is only three football fields wide at the narrowest point rim to rim, and taller than the tallest building in the world at the deepest point. At Chasm Point, the canyon is deeper than wide! Compare that to the Grand Canyon, which is on average 10 miles wide and a mile deep. The Gunnison River is only 40 feet wide at the narrowest point. The ratio of narrowness to depth, the lack of sunlight at the river, and the black color, give Black Canyon a much more imposing feel. The cliffs on both side of the river are some of the steepest of any park. Looking straight down the 1800 foot vertical drop that is nearly as straight as a building creates wobbling knees and a little vertigo. Make sure the camera strap is around the neck, and hold it extra tight before taking any pictures over the railing. There is no recovery for a dropped camera. Be sure the footing is steady because a strong gust of wind can be disastrous. Shake the railing hard to make sure it’s sturdy and hold on tight while looking down to help the buckling knees. This is not for people who are afraid of heights. South Rim Road is seven miles long with twelve pull outs and short hikes from each to the rim. They offer many different perspectives of the canyon. The views are all dramatic, looking across the narrow and deep canyon, with some of the steepest cliffs you will see anywhere. The road ends at High Point, elevation 8289 feet and the trail head for Warner Point Trail. Warner Point trail is a moderate 1.5 mile round trip with excellent views of the mountain ranges that surround the canyon along the way. 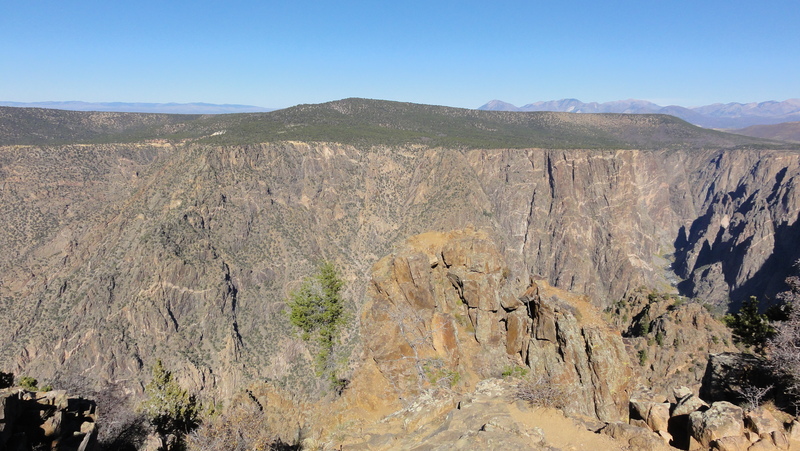 The end of the trail has an excellent view of the Gunnison River and the deepest part of Black Canyon. The most interesting view point is the Painted Wall. As the name implies, it looks like God took a paint brush and made broad strokes on the rock wall canvas. When the afternoon sun shines on it, the subtle colors come out. 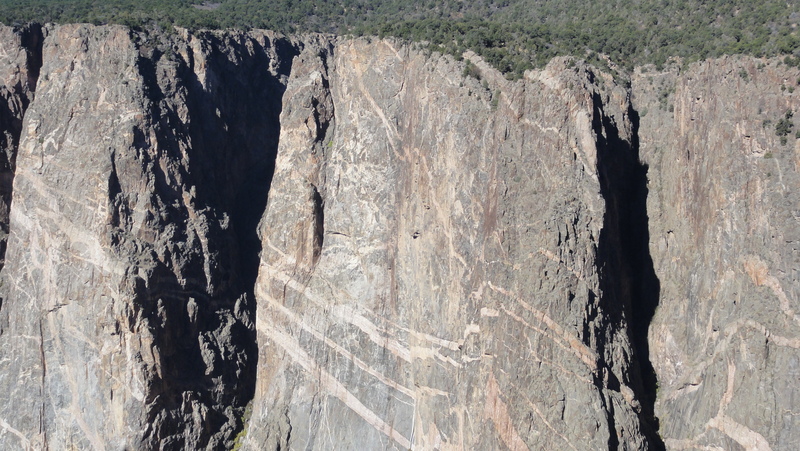 If you thought South Rim is steep, the North Rim is steeper and nearly vertical. North Rim is not as accessible since it is 90 minutes from Montrose, Colorado. By comparison, South Rim is only 20 minutes from Montrose. There are six overlooks on the North Rim accessed by a gravel road. Prepare to get your car dusty! The reward of all that trouble is solitude and more dramatic scenery. When we visited the North Rim on a beautiful October day, we saw only two other cars the three hours we were there. We lingered at the rim for an extended time, just enjoying the sun, the wind, the circling hawks, and the sound of the rushing river below, without another soul around. 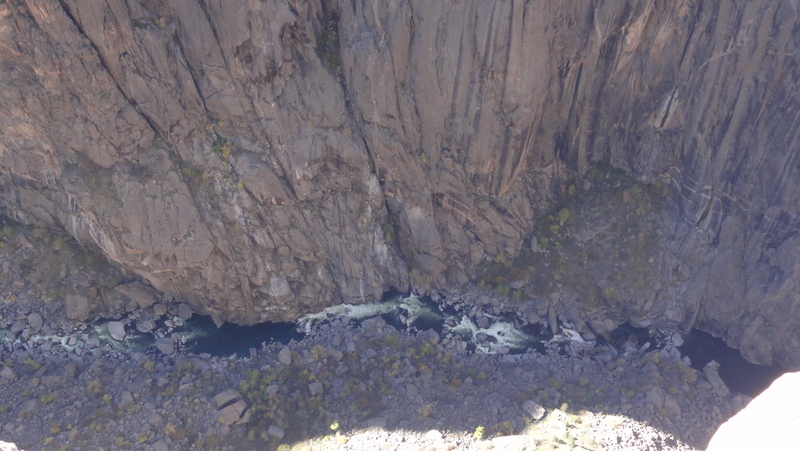 So you want to see what it’s like to be on the banks of the Gunnison River looking up? East Portal Road can get you there without breaking a sweat (for you, but not your car). This is a road for drivers with steady hands as the steep and winding road descends down the southeast side of the canyon. This section of the canyon is not as steep as the northern part of the park. When it reaches the river, the scenery is disappointing. There is a picnic area, some camp sites, and a couple of ugly dams. Have you seen the Milky Way in person? Black Canyon of the Gunnison is designated as a Dark Sky Park. On a clear moonless night, the Milky Way is clearly visible. The South Rim is easily accessible and elevated to provide a very dark environment to enjoy the twinkling stars. Many of us who live in urban and suburban places are not even aware of light pollution that prevents us from seeing the true night sky. The countless stars and the famed Milky Way inspire adventure dreams and the desire for exploration. Mr. Sulu, set warp speed and here we come! 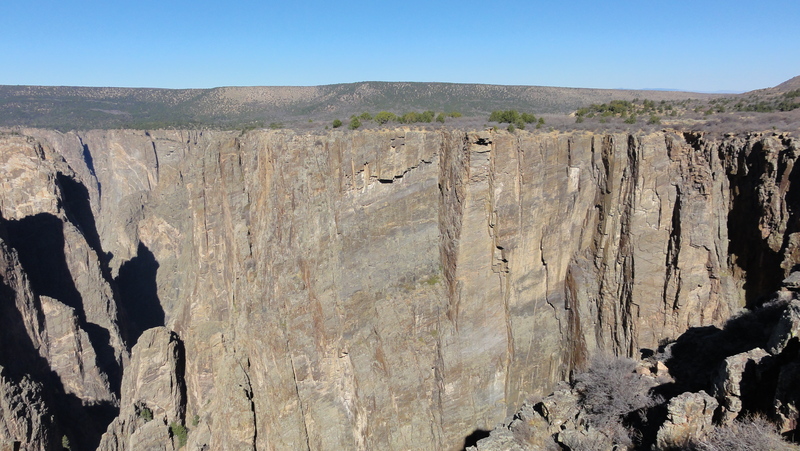 Black Canyon has two interesting stories. First, since water is life in this dry climate, a water diversion tunnel was built from East Portal and connects with South Canal to feed the farmlands of the Uncompahgre Valley. Second, a narrow gauge railroad was built right through the unforgiving canyon that offered a thrilling ride to the passengers but at the cost of many lives during construction. Noisy environment hides the truth . Stripe away the noise to see the true potential, just like stripping away light pollution reveals the beautiful stars. Get rid of the noise in your life to discover hidden gems. The deep, narrow, and steep canyon is awe-inspiring and intimate at the same time. While this is not a park for the faint of heart, the canyon sights are easily accessible. This is a single purpose park, with one unique attraction viewed multiple ways. But how many views before it becomes repetitious, however beautiful it is. The canyon is so narrow you can see people on the opposite rim with the naked eye. The narrow, deep and steepness is the calling card. The feeling can not be captured in pictures. The park is compact and easy to tour, but lack variety. Hiking into the canyon is only for the most expert hiker, excluding most of us. Canoeing and rafting are nearly impossible in this part of the canyon. 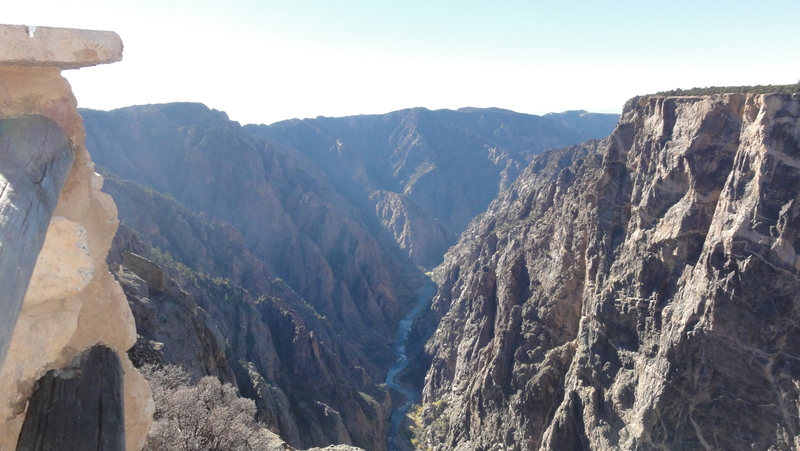 Have you visited Black Canyon of the Gunnison National Park? Leave a comment below on your experience. The park is compact. The primary tour route is only seven miles long. If you only have a few hours, drive the length of South Rim Drive and stop at Gunnison Point, Chasm View, Painted Wall, and Sunset View. NPS web site discourages hiking into the canyon for all but the most expertly, fit people. North Rim is rustic. The more dramatic and knee buckling view is worth it if you have more than a day at the park. View at the bottom of East Portal Road is not worth the time unless you really want to get to the river. Montrose, Colorado is a relatively big town with excellent services as the gateway to Black Canyon. Size: 32,950 acres, ranked 51st. Visitors: 307,143 in 2017, ranked 43rd. Entrance Fee: $15 per vehicle or $7 per person with no car.